by Lynne Bond and Bettina Covo. The importance of providing arts education – including music – for our children is immeasurable. And until recently, music education was accessible to every public school student in the United States. Sadly, this is no longer true. With the erosion of arts education, many parents are forced to find alternatives if they want to expose their children to music lessons. The good news is that free or low-cost options do exist. Local youth orchestras such as the New York Youth Symphony provide free instruction for highly-talented, well-trained students. The newly formed National Youth Orchestra, organized by Sir Clive Gillison at Carnegie Hall, auditions the crème de la crème of music students from around the country to perform and tour with different international conductors, again free of charge for the students. But both of those youth orchestras are geared to students with families who understand the importance of music education and who also have the resources to give their children every opportunity available. Many kids don’t have those same advantages, but they still deserve the chance to learn music. 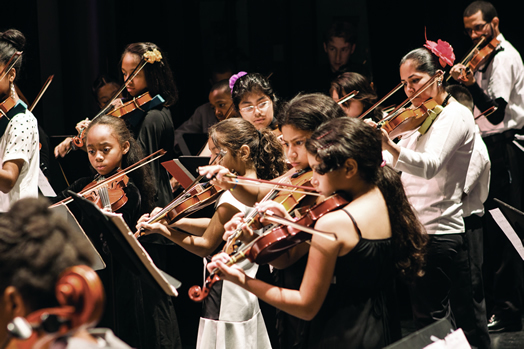 There is an alternative for these students – youth orchestras based on the El Sistema model. In 1975, José Antonio Abreu, a Venezuelan economist and musician, had a vision – a regional youth orchestra for underprivileged children from the inner cities of South America. Abreu believed that his orchestra would not only be a shining example of the formative power of music, but could eventually initiate social change. His vision was realized when he formed the Simón Bolívar Youth Orchestra, made up of children from the urban slums of Venezuela. And so began “El Sistema” (which means “The System” in Spanish). Jherek Bischoff, a songwriter and arranger from Seattle, made his 2012 debut album, “Composed” (Brassland), with low-budget digital diligence. He built the album’s orchestral arrangements by recording one instrument at a time on his laptop. He then drew on some impressive contacts to add vocals, among themDavid Byrne, Caetano Veloso, Nika Danilova (better known as Zola Jesus), Zac Pennington of Parenthetical Girls and the indie-pop songwriter Mirah Zeitlyn, along with drumming from Greg Saunier of Deerhoof. They recognized a fellow pop experimenter. Mr. Bischoff reassembled the songs in real time when he performed on Wednesday night at St. Ann’s Warehouse in Brooklyn, starting a two-night stand. Mr. Veloso was not on hand, but the other singers and Mr. Saunier were, along with the songwriter Sondre Lerche. The chamber orchestra Contemporaneous, conducted by David Bloom, played Mr. Bischoff’s lapidary arrangements of songs from“Composed” and from his guest songwriters. Mr. Bischoff himself played ukulele, often picking lacework patterns, or electric bass. Mr. Bischoff works in territory explored recently by Sufjan Stevens and, decades back, by Van Dyke Parks. The orchestra is a full partner in his songs, conjuring bygone luxury, pastoral retreats or suspenseful reveries. Mr. Bischoff is fond of waltzes and hints of waltzes, of fluttering trills, of sweeping Romantic crescendos and of sighing violin countermelodies. “Eyes,” featuring Mr. Byrne, was a plush, string-laden bolero. In “Young & Lovely,” sung by Mr. Pennington and Sam Mickens, the strings had repeating, Philip Glass-like figures, but they rode a brisk hoedown beat and were answered by mocking trombone. Copyright 2015 - Daniel Linden.